It’s been a couple of weeks since I mentioned having the last book at the proof stage, and it’s now up for sale as of the 7th. The name is WordyWords – Grocery Store List Edition. You can check it out on Amazon or visit the publisher site. 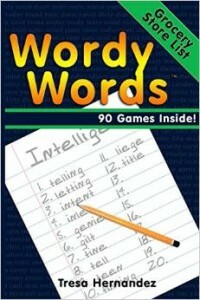 These books are really awesome if you’re into word games and have a strong vocabulary (or want to build one). The theme of this one starts off each puzzle with a word that is commonly found on a grocery store list. I’ve recently started working on editing the next book in the series of WordyWords books, but that will be a bit still before I have any news there. WordyWords – Grocery Store List Ed.